Have you heard about The Great Food Blogger Cookie Swap? I hadn’t until a few months ago when I signed up. Basically, you sign up, make a donation, wait for your matches, bake your cookies, package your cookies, send your cookies, oh and let’s not forget, you receive cookies too. But it’s not all just about sending and receiving cookies, the donations are for Cookies for Kid’s Cancer, a not for profit organisation looking for the improved research into therapies for paediatric cancer, such a great cause that I’m delighted to be a part of! Here’s what you’ll need to make these cookies. Pre heat oven on 180c. Cream butter, sugar and peanut butter, add in vanilla and eggs and combine well. Add flour, salt and baking powder. Mix until just combined, turn mixer off and scrape down the sides. Crush your pretzels and chop your peanut butter cups, throw these into your mixer and mix on a very low speed until it is spread throughout the cookie dough. Roll into 2.5cm balls (you should get about 40 cookies), lay on a cookie sheet leaving 2.5 cm gaps between each one, and flatten slightly. Bake for 12 minutes. Once these babies were baked, I let them cool, then placed 6 cookies into 6 ziplock sandwich bag (2 bags per blogger, 1 dozen each). I sent the package with a little note from me, and I used these coookie swap printables from Love and Olive Oil. I bubbled wrapped them and placed them in a mailing box from AusPost, next time, I think I’ll wrap my cookies well and send them in a satchel instead, sending out 3 packages of cookies in boxes proved to be an expensive exercise. These cookies were sent to Erin of Cut the Cookie, Muppy of Muppys and Manuela of Manu’s Menu. As exciting as it was to make and send my cookies it was even more exciting receiving cookies in the mail. I received roasted almond honeycomb cookies from Amanda at Chewtown, white chocolate cranberry cookies from Daisy of Never Too Sweet and date and walnut cookies from Kate of Cooks Companion. Thank you ladies all so much, the cookies were delish! The Great Food Blogger Cookie Swap 2012, done and dusted, I look forward to participating next year.Thanks to Love and Olive Oil and The Little Kitchen for organising such a wonderful event. Yes, I know, I haven’t blogged in a while, its been a busy time for me. I’ve been in the process of completing my teaching diploma and was on my first practical, a six week placement in a year one class. It’s hard to run a household, a marriage and look after a child while having to be out of the house for 7 hours a day, alhumdulillah, the experience was great and extremely fulfilling, although I am relieved that it’s over (for now anyway). For those of you that read my blog and remember, I took part in a Dilmah competition a few months ago where I entered these Chai Macarons (if not, you can read about it here and here). These macaron shells were flavoured with tea, cardamon, cinnamon and sandwiched with a chai white chocolate ganache. I’ve finally gotten the chance to post the recipe. Yippee!! I’ve attached the recipe in .pdf format because that’s how it’s saved on my computer as I needed to give a copy to the Dilmah officials and figured it would be the easiest way to share it with all of you. This recipe is made using the Italian meringue method (pouring a hot sugar syrup into egg whites) instead of my usual French meringue, if you have a handle on the French meringue method, feel free to use that, just remember to add the spices to the almond/icing sugar mixture. 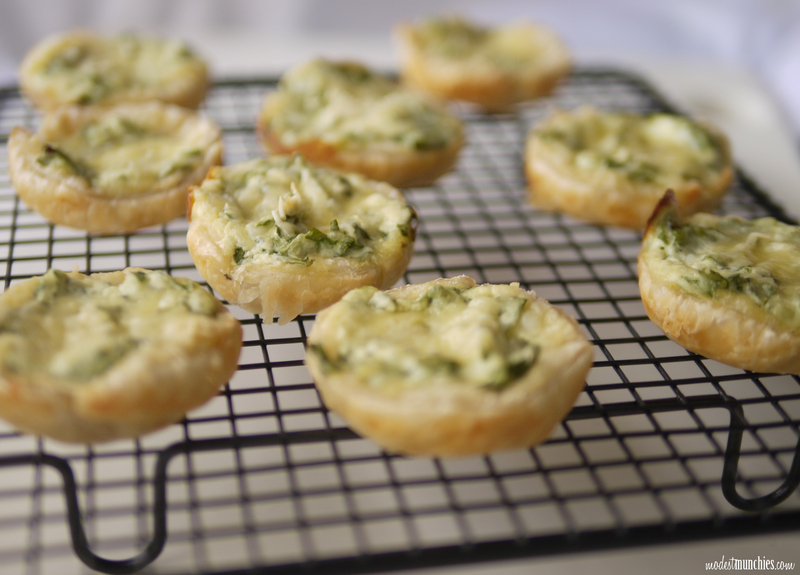 Give these a go, and if you’re not too afraid (and have a thermometer lying around) try the Italian method. 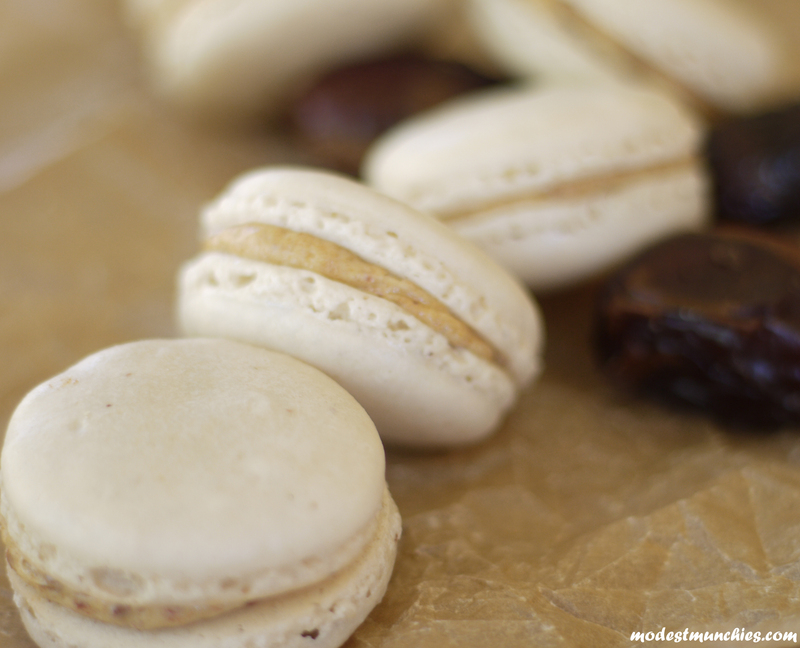 Chai macarons with a pot of tea, perfect late night snack, enjoy! Do any of you remember a time when red velvet cupcakes and macarons weren’t so unbelievably popular, I do, but those memories seem to be slowly fading into the distance. Red velvets were not a favourite of mine to begin with, I had tried it a few times and was never impressed, until this recipe of my own. I’ve been enjoying them ever since, I think I just had a few bad experiences in the beginning. Macarons on the other hand, I’ve loved ever since I tasted my first one while holidaying with my husband in Singapore, this was before they became trendy in Australia and I’ve pretty much been obsessed ever since. 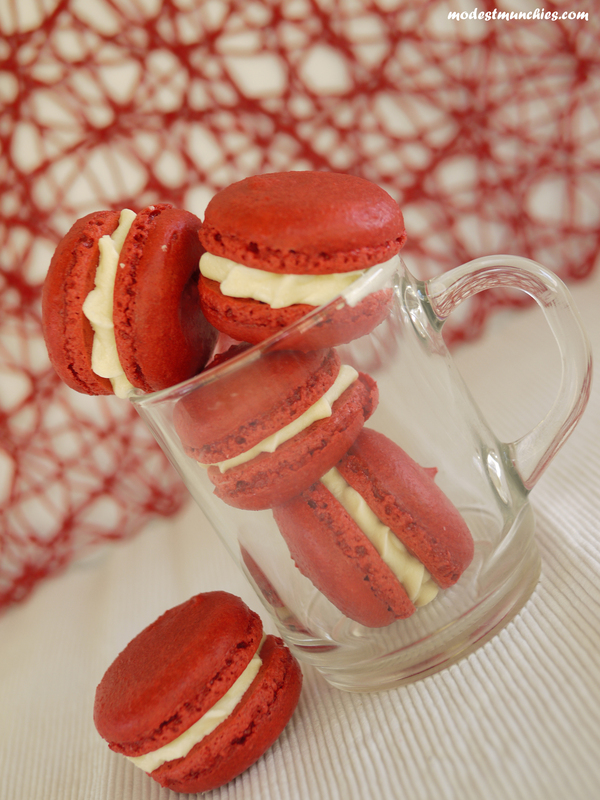 With that said, I thought I would combine these two ever so popular treats into one mega treat… Drum roll please… The Red Velvet Macaron! Yip, that’s right, a red macaron with a light hint of cocoa, sandwiched with a smooth cream cheese filling, what’s not to love? Measure out your ingredients. Combine almond meal, icing sugar and cocoa powder, grind these till you achieve a fine powder. Whip egg whites till foamy, slowly stream in the sugar until egg whites are stiff and glossy. Add in gel colouring and give it a quick beat until it turns an even red. Sift almond meal, icing sugar and cocao mixture on top of egg whites and fold until just combined. Pre heat oven to 150°c. Fill mixture into piping bag and pipe 3cm rounds onto baking paper lined trays. Let mixture sit for 15-30 minutes. Place in oven for 15 minutes or until tops don’t move when pushed with a finger. Beat butter, cream cheese and vanilla essence in a bowl until creamy and combined. Slowly add sugar till smooth and fluffy. Fill in a piping bag and pipe into macaron shells. Love Red Velvet Cupcakes? Love Macarons? 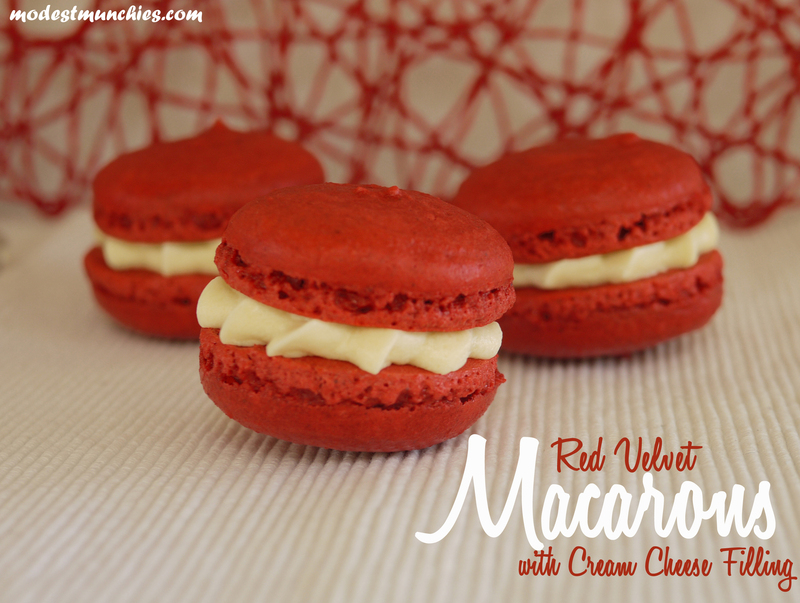 Then you’ll love these Red Velvet Macarons. Red with a delicate hint of cocoa, accompanied by a cream cheese filling, yum! Ramadan is now far behind us, I know, but if you’re like us (we tend to stock up on dates, 7kgs worth), you might still have some left over. If you want to use up some dates or just want a datey (totally a word, right?) treat, try these! These macarons are slightly different to the norm, brown sugar is used to make the meringue instead of the usual white sugar. 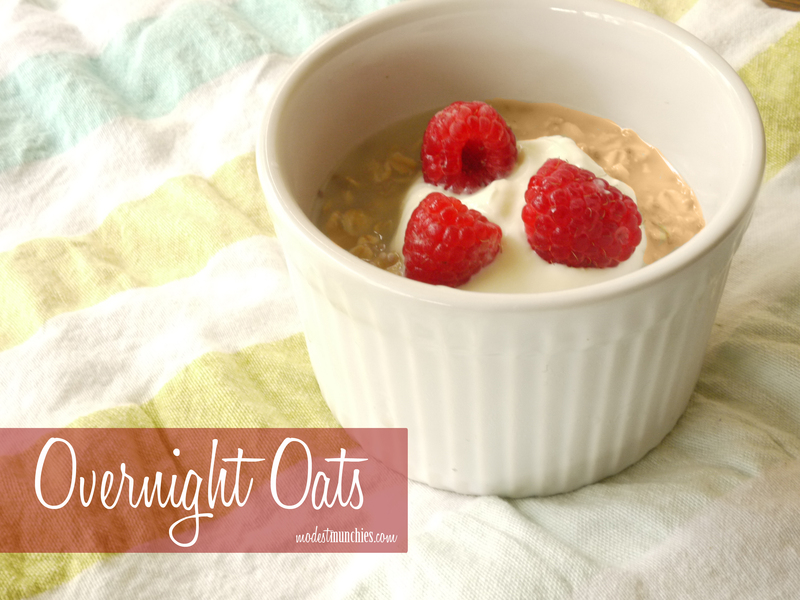 The brown sugar gives a subtle taste difference as well as a slight creamy tinge. Measure out your ingredients. Combine almond meal and icing sugar and grind till a fine powder. Whip egg whites till foamy, slowly stream in the brown sugar until egg whites are stiff and glossy. Sift almond meal and icing sugar mixture on top of egg whites and fold until just combined. Pre heat oven to 150°c. Fill mixture into piping bag and pipe 3cm rounds onto baking paper lined trays. Let mixture sit for 15-30 minutes. Place in oven for 17 minutes (I found that the substitution of brown sugar required the macarons baking for a little longer then usual) or until tops don’t move when pushed with a finger. Pit dates and place in a bowl, fill with hot water until all the dates are immersed, leave to soak for 10 minutes. Cream butter till fluffy. Drain all excess water from the dates and process till smooth and pasty. Add date paste and butterscotch to butter, beat until combined. Fill a piping bag, ready to fill macarons. Place sugar and butter on a medium heat on the stove. Mix till sugar dissolves. Add in cream and mix till combined, set aside to cool. To assemble macarons, pipe sticky date filling into one macaron shell and sandwich with the other. 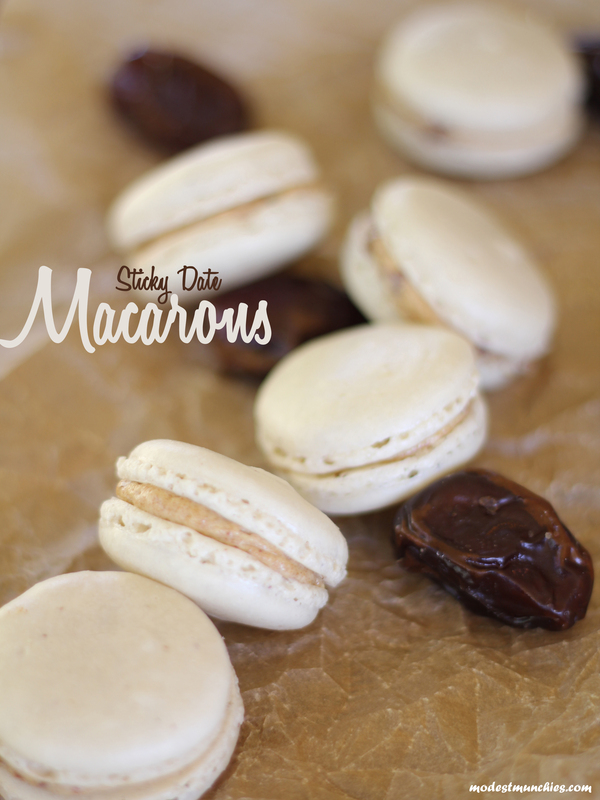 Sticky, datey, yummy macarons! My sister in law is visiting us at the moment and she comes with some unique dessert concepts from her time spent in the USA. When most people think of american desserts, images of syrup drowned layers of pancakes, face sized cookies and deep fried chocolate bars probably come to mind, but this is different. This cake is a Spanish inspired favourite. A cake soaked in a 3 milk mixture. This cake is amazing; a soft, moist cake topped with a layer of cream. After putting our ideas together, we came up with the recipe below. This stays true to the original Spanish cake, but using our own recipe for the cake and adapting the milk mixture to suit. Pre heat oven to 180°c and grease a 9×13 inch pan. Beat together butter and sugar. Once creamed add in eggs 1 at a time, ensuring each addition is mixed well. Add in vanilla essence and mix. Combine baking powder, bicarb soda and salt with flour. Alternate between adding flour and milk until flour is your last addition. Once all mixed, pour into a baking tray and level. Bake for 40 minutes or until skewer comes out clean. Set aside to cool. *You can substitute this cake recipe for any light spongy cake recipe you already use or like. Combine milks in a pouring jug. Once cake is cooled, turn upside down into a dish with high sides (this will ensure no milk spillage), poke cake all over with a fork. Slowly pour milk mixture slowly and evenly onto cake until mixture is finished, set aside to soak and absorb. Best served after a night of soaking. Whip cream and sugar till firm. Level onto soaked cake on the day of serving. Decorate with chocolate or fruit. Hope you’ll enjoy this dessert as much as we have. 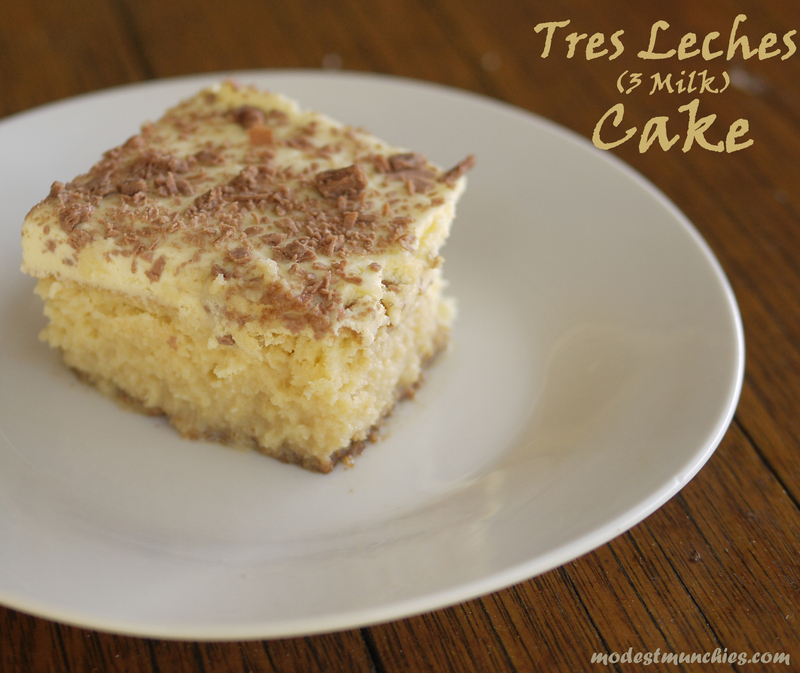 Thank you to Aasiya for the inspiration for this Spanish Tres Leches Cake.